Easily Diagnosed, Cured or its Cancer Treated Successfully?
. . . The esophagus is in the chest and is about 10 inches long and the esophagus is part of the digestive tract. Food moves from the mouth through the esophagus to the stomach. Inner layer or lining (mucosa): The lining of the esophagus is moist so that food can pass to the stomach. Submucosa: The glands in this layer make mucus. Mucus keeps the esophagus moist. Muscle layer: The muscles push the food down to the stomach. Outer layer: The outer layer covers the esophagus. However, this process goes wrong sometimes. New cells form when the body does not need them, and old or damaged cells do not die as they should. The buildup of extra cells often forms a mass of tissue called a growth or tumor. Growths in the wall of the esophagus can be benign or not cancer or malignant or cancer. The smooth inner wall may have an abnormal rough area, an area of tiny bumps, or a tumor. Benign growths are not as damaging as malignant growths. 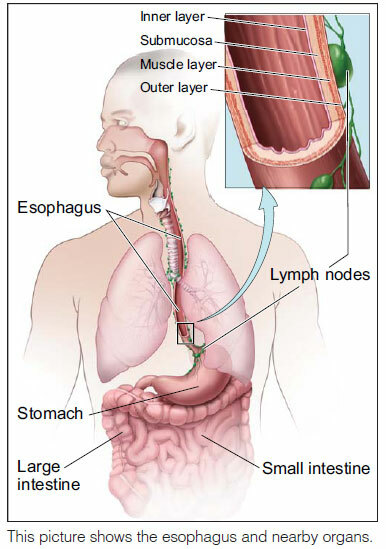 Esophageal cancer begins in cells in inner layer of esophagus. Over a manner of time, the cancer may invade more deeply into the esophagus and nearby tissues. Cancer cells can spread by breaking away from the original tumor. They may enter blood vessels or lymph vessels, which branch into all the tissues of the body. The cancer cells may attach to other tissues and grow to form new tumors that may damage those tissues. The spread of cancer cells is called metastasis. See the Staging section for information about esophageal cancer that has spread. There are two primary kinds of esophageal cancer. Both types of esophageal cancer are managed, diagnosed and treated in similar ways. Adenocarcinoma of the esophagus: This type is usually found in the lower part of the esophagus, near the stomach. In the United States, adenocarcinoma is the most common type of esophageal cancer. It's been increasing since the 1970s. Squamous cell carcinoma of the esophagus: This type is usually found in the upper part of the esophagus. This type is becoming less common among Americans. Around the world, however, squamous cell carcinoma is the most common type. When you get a diagnosis of cancer, it's natural to wonder what may have caused the disease. Doctors can seldom explain why one person develops esophageal cancer and another doesn't. However, we do know that people with certain risk factors are more likely than others to develop esophageal cancer. A risk factor is something which can increase the chance of getting a medical condition or disease. Click now for Health Tip of the Day. Age 65 or older: Age is the main risk factor for esophageal cancer. The chance of getting this disease goes up as you age. In the USA, most people are age 65 years or older when they are first diagnosed with esophageal cancer. Being male: In the United States, men are 3-times as likely as women to develop esophageal cancer. Smoking: People who smoke are more likely to develop esophageal cancer. Heavy drinking: People who have more than 3 alcoholic drinks each day are more likely to develop squamous cell carcinoma of the esophagus. Heavy drinkers who smoke have a higher risk than heavy drinkers who don't smoke. In other words, these two factors act together to increase the risk even more. Diet: Studies suggest that a diet that's low in fruits and vegetables may increase the risk of esophageal cancer. However, results from diet studies don't always agree, and more research is needed to better understand how diet affects the risk of developing esophageal cancer. Obesity: Being obese increases the risk of adenocarcinoma of the esophagus. Acid reflux: Acid reflux is the abnormal backward flow of stomach acid into the esophagus. Reflux is very common. A symptom of reflux is heartburn, but some people don't have symptoms. The stomach acid can damage the tissue of the esophagus. After many years of reflux, this tissue damage may lead to adenocarcinoma of the esophagus in some people. Barrett esophagus: Acid reflux may damage the esophagus and over time cause a condition known as Barrett esophagus. The cells in the lower part of the esophagus are abnormal. Most people who have Barrett esophagus don't know it. The presence of Barrett esophagus increases the risk of adenocarcinoma of the esophagus. It's a greater risk factor than acid reflux alone. Many other possible risk factors, such as chewing tobacco have been studied. Researchers continue to study these possible risk factors. Having a risk factor doesn't mean that a person will develop cancer of the esophagus. Most people who have risk factors never develop esophageal cancer.